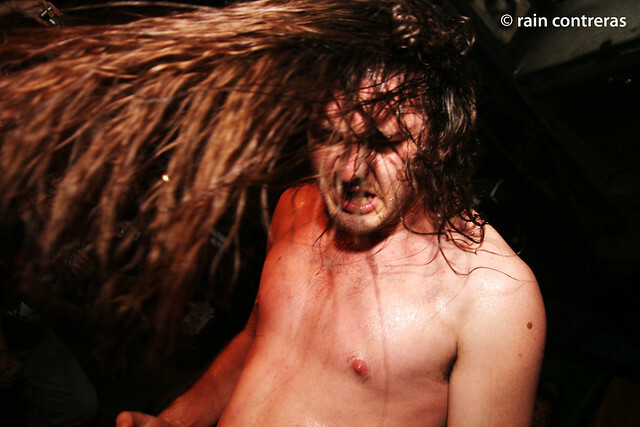 I deem keeping online social networks necessary, even for just being updated on gigs to shoot. This was a big deal when people were still active on Mutliply, and now that everyone’s on Facebook, I always have a keen eye on the Events section. However, the gig poster for US thrash metal band Warbringer just came out of my news feed since some random person tagged cosplayer Alodia on it. Ha! See, unlike a lot of people I see online on forums who shoot gigs, I’d really rather not settle just covering the popular bands in the popular band haunts. That’s how I found myself in Tatalon for a local metal gig (photos), or more recently, a Bulacan gig sponsored by a local politico (photos). However, I don’t easily get excited just because a foreign band is visiting. I didn’t know Warbringer, the ticket was pegged at 400 pesos. What got me? Two words: Century Media, a record label I’ve known since the 90s, which has acts like Arch Enemy, Deicide, and personal favorite Napalm Death under its wing. There were Youtube videos of the band as well, and that pretty much sealed the deal. 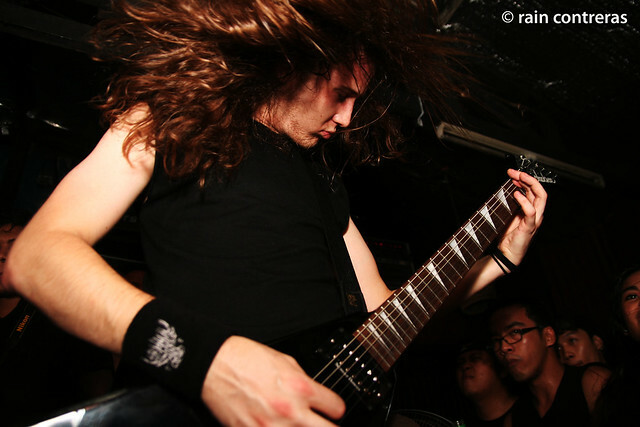 Warbringer was straight-out, no-frills thrash metal. So, without anyone willing to come with me to the supposed 6PM gig, and fresh from the high of shooting a “bikini rock gig” two days earlier, I was at a place I’ve never been in (Center for Arts in Timog, QC), and wearing a red shirt that makes me stick out. Yes, I knew better, but really didn’t care. Around 8, the support acts started, but no mosh pit yet, so I stuck myself to where I was, taking the humidity in. A few bands later, the pit formed, and of course I positioned myself in front. Out of all the acts, death metal band Pathogen stuck out, with guitar solos that will make the metal gods beam with pride. When Warbringer’s set was up, I was in front of bassist Andy Laux, semi-safe from the pit, and what I assumed would be a good place to shoot. It actually was, and for about half of their set, I didn’t leave. Sweat-drenched -my own, the pit’s, the band’s- I looked for another position, and this was about the time vocalist John Kevill wanted bodies flailing, hence the crowd was halved, giving me the chance to shoot from the other side. I went for it, since my legs would hurt from the shoving when the collective of metalheads behind me would start widening the pit, like I was this reluctant wall separating the crowd from the slightly elevated stage. With a few songs left, I started to go easy on the shooting, marvel at the energy of the event itself (no major production behind it, no apparent sponsors), and ultimately ignoring how weak and lacking the sound system was to do Warbringer justice. I spent the last song farther from the crowd and stage, and just took it all in. View the entire photoset here, or in slideshow form here.